The Yupiteru MVT7000 is the predecessor of the MVT-7100. The scanner uses an MC3361 FM detector IC. 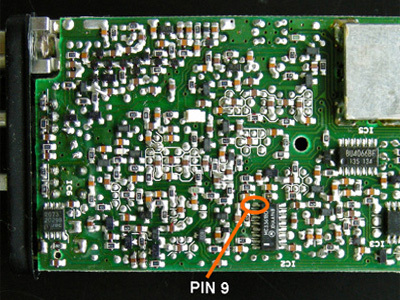 The baseband audio can be found on pin 9 of this IC. To separate the two scanner halves, the dial knob should be removed and its washer loosened with a pair of fine tip pliers. 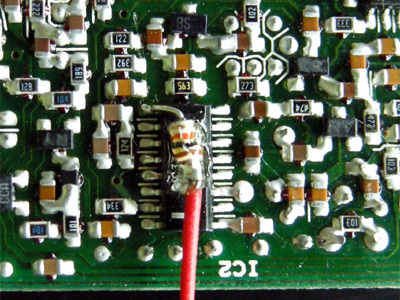 A 10 k resistor is soldered to pin 9 of the MC3361. To improve the mechanical stability, the resistor can be fixed to the IC by a drop of hot glue. The other lead of the resistor is connected to a 3.5 mm chassis terminal, that can be mounted in the side of the scanner. 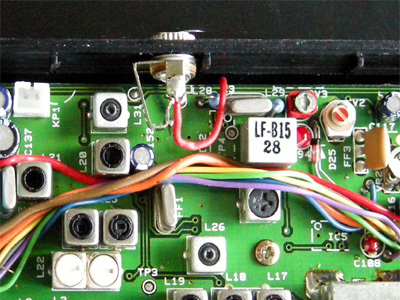 The ground connection of the chassis terminal can be connected to the ground of the circuit board. Some protective lacquer has to be removed to solder to the PCB. Many older MVT-7000 scanners have memory problems. It might be a good idea to replace the memory capacitor ('GoldCap') while performing the discriminator modification.